Forget everything you thought you knew about pirates. 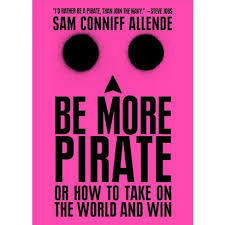 Be More Pirate by Sam Conniff Allende is a book that I first came across on Blinkist. (If you haven’t come across this app you might like to look it up) After listening to the blinks there, I got the full book and read more. Sam explores a very specific period of piracy from around 1690 to 1725, the so-called Golden Age of Piracy. Many of their principles and the approach they took, were ahead of their time. And in the same way as now, at the turn of the 18th Century it was also an age of uncertainty – which brings with it a fertile ground for opportunity. There are a great many lessons we can learn from the golden age pirates who stood up to the establishment. All of which are interwoven with setting leadership direction, values, mission, engagement, motivation, autonomy, communication and purpose. Areas that are having increasing impact and reach in organisations today. I hope this has whet your appetite sufficiently to read more from the book, get in touch with me or start some social change and piracy of your own.